Home chalkboard paint decor ideas DIY Handmade home decor Lifestyle 40 Creative Chalkboard Paint Ideas: DIY Handmade projects to try today! 40 Creative Chalkboard Paint Ideas: DIY Handmade projects to try today! Every time I reached school early , it was a happy start to a morning for I would spend hours decorating the blackboard in my class. Writing a ‘Thought Of The Day’ and decorating the huge blackboard’s corners with floral motifs, my love for chalkboard has only increased with passing time. I was afraid of blackboard back in school when I would stand traumatized in front of my entire class, chalk in my quivering hand, trying to solve the most complex maths sum. But with passing time my love for chalkboards has increased even more. I came across so many chalkboard paint crafts which reminded me of my school and college days. 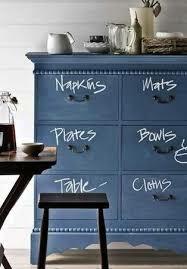 Chalkboard paint is one thing which is inexpensive and handy when decorating your homes. I think using chalkboard paint to decorate walls, furniture and other pieces is just so versatile. While I am planning on getting chalkboard decor for my apartment I came across few of the best chalkboard decor ideas and now I am crazy for chalkboard paint. Chalkboard painted decorative home decor such as wall decor or even chalkboard painted furniture have become a favorite with all those looking for thrifty ideas to decorate their homes creatively . Chalkboard decor is a way of showcasing your creativity and people love creative things ! Chalkboard painted decor and chalkboard painted furniture hare the hottest trends in interior designing and interior decoration today! There is no doubt that using chalkboard paint is a very interesting way of decorating your homes because you can DIY it. Cool eh? Getting to draw anything you want or write anything stylishly on it and not to forget you can have different fabulous designs every single day, just erase and write ! Simple and creative! what more could a home decor lover on a budget ask for? There are numerous reasons why I love chalkboard paint as decor. Chalkboard paint helps us turn countertops and coffee table tops into brainstorming space, hide blemishes on furniture,turn wine bottles into stunning customized gifts, and simply liven up boring party decor and add a bit of creativity to our walls! Chalkboard paint crafts and DIY chalkboard projects can be very functional and in the same time creative. Check out our favorite chalkboard projects, and try a few for yourself today! We present you 37 brilliantly crafted creative chalkboard paint projects you can DIY today! In 2016 we have definitely seen chalkboard styles trending and guess what its still trending in 2017! Now that we all love chalkboard paint , why not combine it up with another thing we all love - a pretty see through jar , functional and they are sure to make your kitchen look cute! What better than sleeping along with these cute lamps beside you. 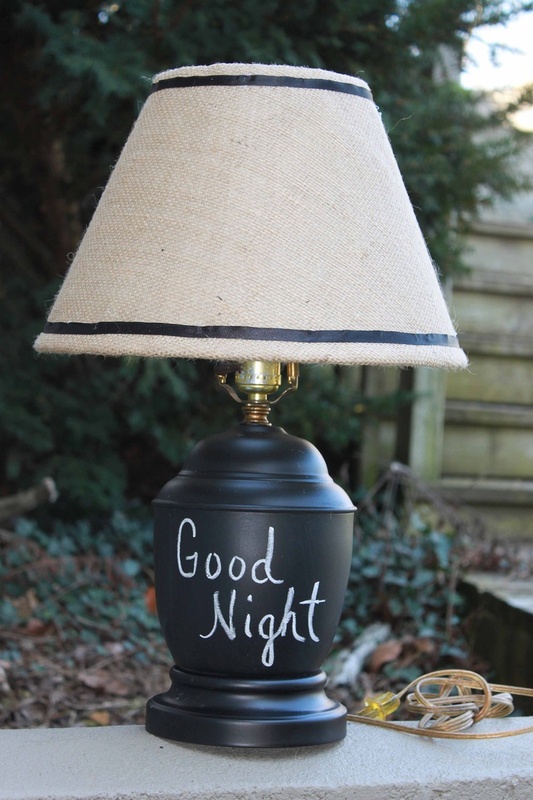 You can even leave a ‘good night’, ‘sweet dreams’ note for your loved one in his/her bedroom! Paint a few balls with chalkboard paint and you have cute ornaments to be used as ornaments for Christmas presents or even to decorate your Christmas tree. The best way to hide blemishes off your old table is to get it chalkboard painted and viola you have a beautiful functional table! If you want to bring a bit of unique decor into your home without spending an arm and a leg, this chalkboard furniture DIY inspired project is a must try ! Organizing just got more creative and fun ! If you are a jewelry, makeup and accessory shopper like me , this is going to make it more easier for you to organise your things. Log coasters are great to decorate your plain white walls and if you are on a budget these make up for great DIy decor projects. These also make for great gifts if you don't have much money to buy an expensive gift for your friend! Use a big piece of chalkboard and place it on the wall or better get a wood board cut in a tee shirt shape and get it painted. This will create a fun corner for your kids in your house and encourage them to do whatever you assigned them to do. All you need is chalkboard spray paint, A spare board and a saw! Be creative and make you are sure to improvise your interior design . For example using chalkboard paint to make a family chore board on a plain wall and getting rid of the plain ol pinning board idea for a chore board. Besides the classical ways to use Chalkboard paint to decorate your homes with there are loads of different ways you can use it make your old rusty things functional! From an old coffee table top to functional and fun one is one example. All those empty corners of your home can be decorated beautiful by just getting your old empty wine bottles painted ! yes paint them with a little chalk paint and you have a beautiful cheap decor for your side table ready! Its always fun to give your parties and get together something to talk about. Have you ever thought of giving your serving tray's a makeover ? A pretty board can be the life of your party- Hell yeah ! Try this and give your get together's a new makeover! One hell of a easy craft idea! This is one of the most fun DIY chalkboard handmade projects and does not require any special skills. 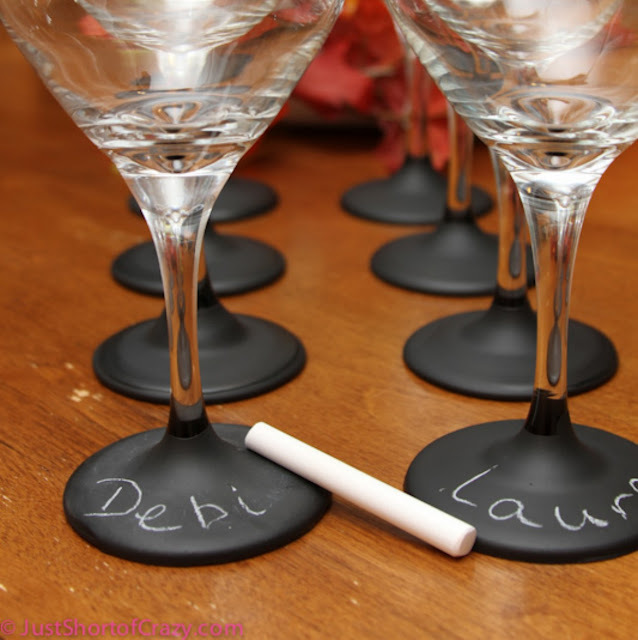 Also these wineglasses dipped in chalkboard paint help the guests to keep track of their wine glasses! This one can easily be slated as easy craft ideas one can try any day! Perfect for indoor herb gardens, this DIY Handmade project is great for plant lovers! 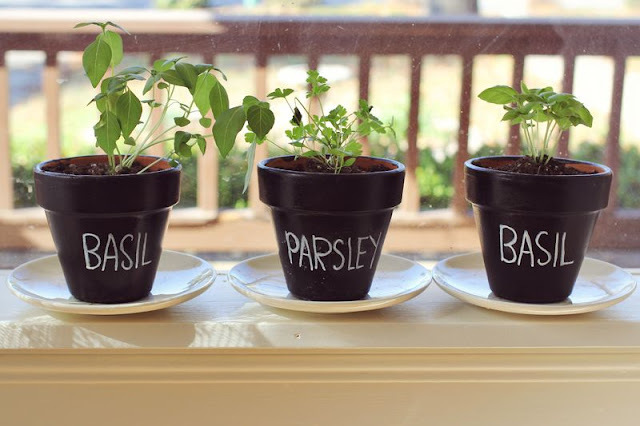 If you are one of those who love cooking and want to grow your own herbs, this DIY project is of great help! Chalkboard paint makes for a great way to make it an art corner in your home. Just paint your wall and you could write something or better if you have kids , give them a chance to get creative with chalkboard paint! 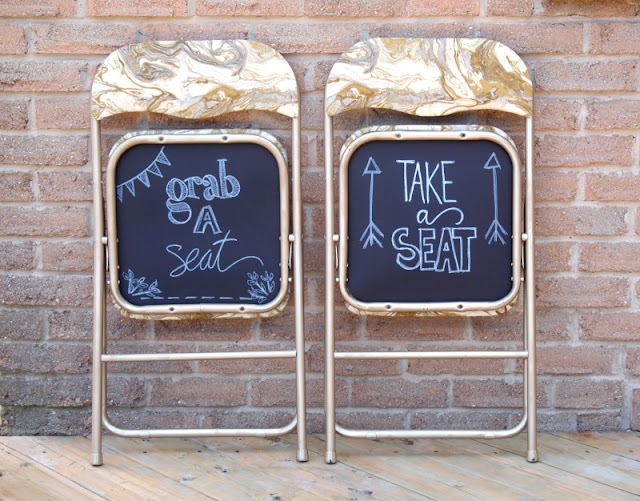 Chalkboard can totally make your plain boring folding chairs into gorgeous pieces of furniture! Don't believe it? Then you have to check out these folding chairs. Either you have a party or just need something to sit on outdoors , you can always put these chairs to good use. They look lovely both indoors and out! Kids always love a little creativity when it comes to their lunch . I loved this idea of painting the lunchbox to write a beautiful message for your kid. Every time your little one opens up the lunchbox , it's sure to put a smile on his face. Cute no? Put your creativity on work and improve your home design or organize a part of your home with this idea. The options for use are unlimited and simple creating a fun time realizing them. The way Happyhappynester does here! Those who throw a lot of parties or host a lot of them a chalkboard table placement is must to try among a few creative options to get the party going on in style. Your sport shoes or the regular running shoes have chipped off or lost their color? Then you must go for chalkboard paint art. A customized message such as ' Good morning' or ' Staying fit' will look cool and not to forget unique! Next time you go grocery shopping you won't forget a single thing you wanted to stack up in the fridge, thanks to these fun and functional DIY grocery shopping bags. Write down the items and get shopping ! Plus this is one of those simple craft ideas everyone can try without any hassle. These chalkboard candles are super cute,If you have a small budget, these DIY chalkboard painted candle decor ideas are fun and cost-effective for your bathroom or your dining room! DIY Decor item needn't be done from scratch, you can easily repurpose an unused item you already own in a creative way. Spray paint your old globe with some chalkboard paint and you have a wow decor item to place on your study or office table. When you have the chipped paint and ugly burn marks on your crock pot its time to give it a fun and functional makeover ! What better than painting it and writing the menu on it every single time you cook it?! Whoever could have guessed that a little chalkboard paint could become a chic kitchen decor wall! You can write on your grocery list or note down important ‘to-do’ list while you are cooking! Every woman with a 'Dream kitchen' must have this on her list! Kitchen chalkboard wall is a great interior decor idea! Give your boring or plain pantry door some visual interest by getting it painted with chalkboard paint and get creative with your white chalk ! You don't have to stick to classic black chalkboard paint but you can also try coloured chalkboard paint! This makes for a pretty chalkboard shadow box. Just paint a old frame and voila you ave the prettiest shadow box to hang over there. Turn your planters interesting by writing a new slogan or an inspiring quote everyday. 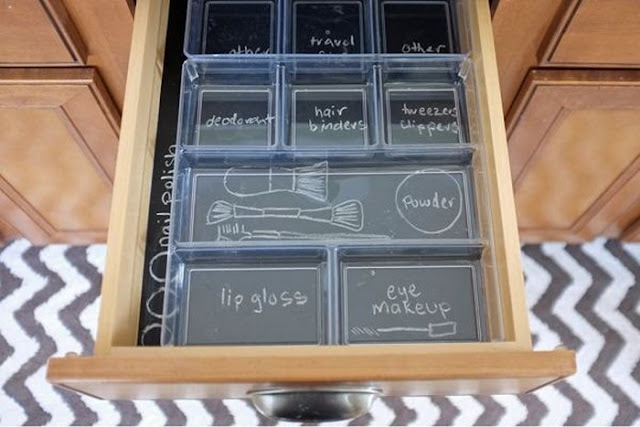 Use an old metal box, chalkboard paint it and you are done! Furniture that can speak on its own? Hell yeah! Functional and lovely from where I can see.! Now you can turn your old cabinet into an useful one by storing kitchen utensils! Thanks to chalkboard paint! If you are broke half of the time like me and want something unique for your bedroom then here's something you will love. DIY chalkboard pillow is fun to make . 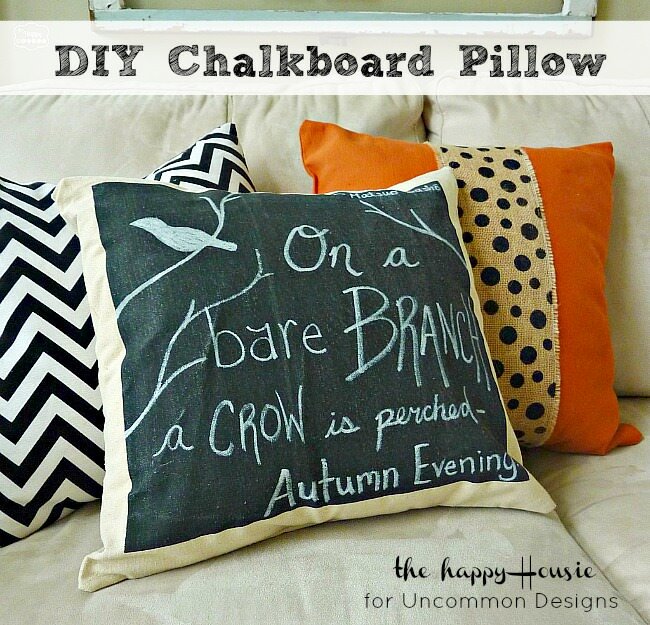 All you need is a pillow cover with a pillow form in , chalkboard paint, chalkboard pen and paint tape with a foam brush! And lastly you need a beautiful quote , that's it. So easy, so beautiful! Cars , we love. But fun cars be the best. You are sure to grab a lot of attention or maybe even pop a lot of eyeballs when you are driving a car so unique. Chalkboard painted cars are fun and unique at the same time. 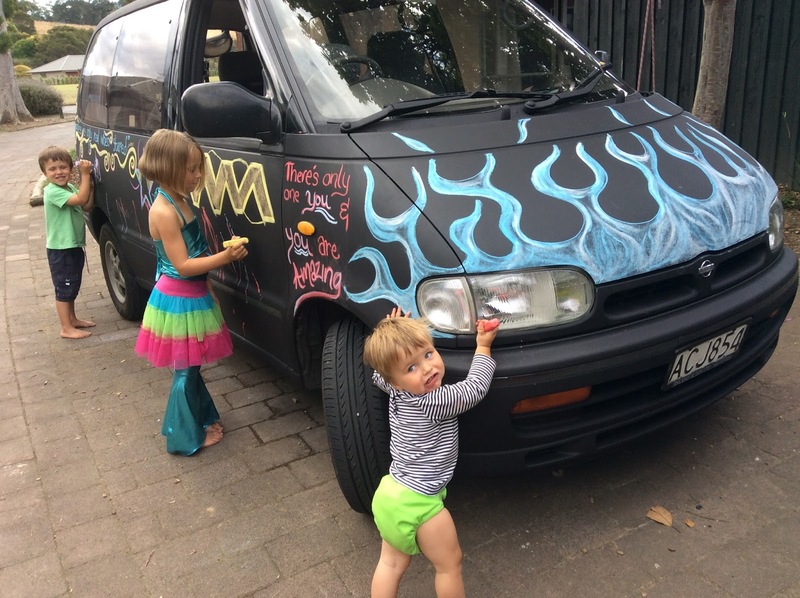 Not to forget makeover of a car so cheap can only be achieved with a lot of creativity and chalkboard is one such creative masterpiece you simply cannot keep yourself from indulging in! 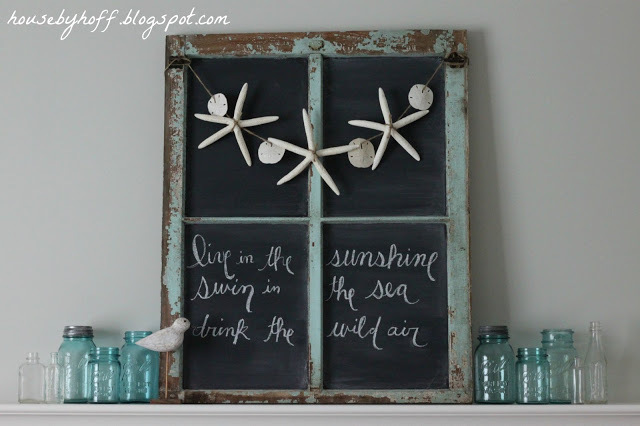 Turn your old windows into a chalkboard window.... And you might be surprised by the outcome which would be a perfection ! DIY your old boring clock into a functional and time telling one, all at the same time!Hang this clock in a kitchen or home office where family plans are made. 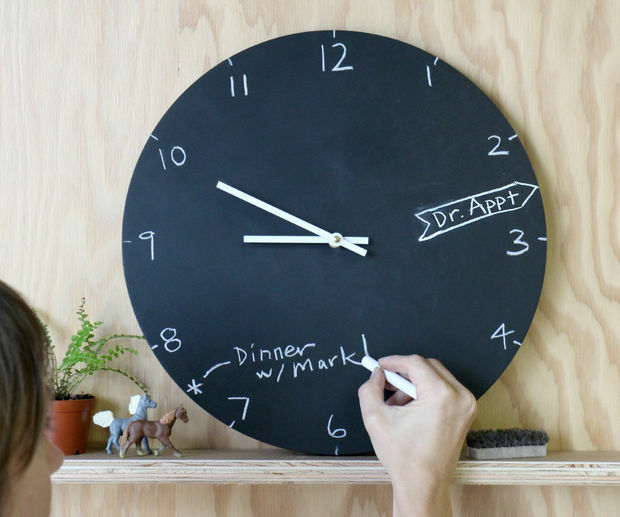 This chalkboard clock clearly makes for a great piece that not only tells the time, but keeps you on schedule with plenty of space to jot down reminders with your chalk. Chalk it up to being creative – what will you paint black today?